Disabled passengers are being "humiliated" and "disrespected" by people who are supposed to be helping them at airports, campaigners have said. A BBC investigation revealed some staff at Omniserv - which provides special assistance at airports - were lifting travellers incorrectly and abandoning those who needed help. 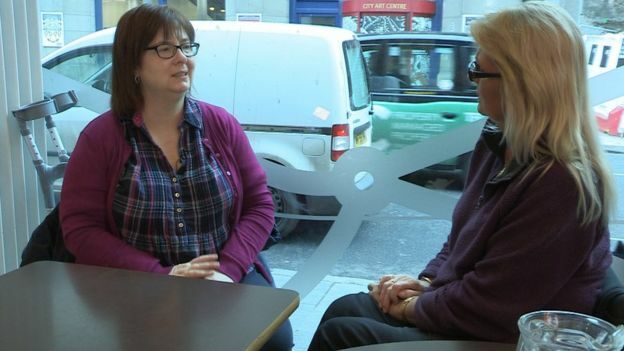 Campaign group Disability Wales said the level of service was "shocking". Omniserv has apologised to customers. All UK airports must, by law, provide free support to any disabled passenger who needs it. That special assistance service includes helping travellers through the airport and on to the plane itself. It also covers the lifting of passengers on to their aircraft seat, while staff should stay with a disabled person at all times when help is needed. But the Civil Aviation Authority has received 279 complaints about special assistance services at airports around the UK in the last two years. 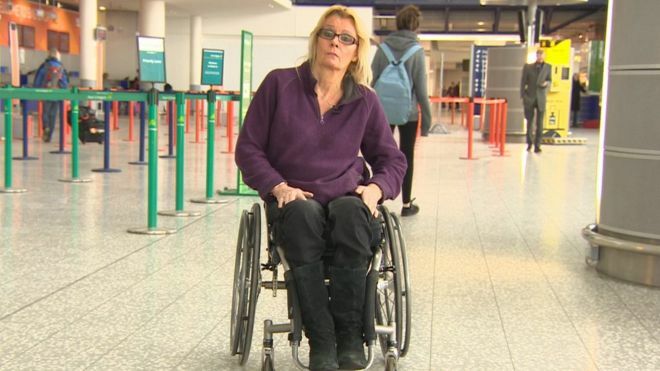 BBC Wales' X-Ray programme has heard from disabled passengers who say they will never fly again after their experiences at Heathrow and Edinburgh airports. Both airports use the company Omniserv to deliver special assistance services. Mel Davies, from Pontardawe, Neath Port Talbot, who is paralysed from the waist down, said she was left in pain after being incorrectly lifted by Omniserv staff on two separate occasions. 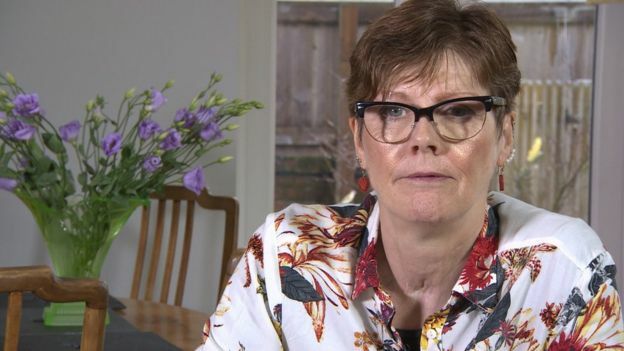 Mrs Davies said she was expecting to be lifted by her arms, which she crosses over her chest - but one staff member lifted her under her armpits into her wheelchair, and another lifted her by her chest. "As someone who's had surgery for breast cancer, I found it painful and upsetting," added Mrs Davies. She said employees also left her at the aircraft door when her plane arrived at Heathrow. 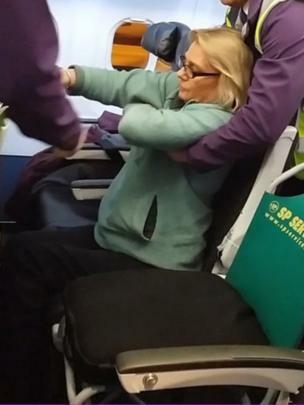 Airline staff ended up helping her into the airport. Jan Crispin, from Winchester in Hampshire, was left waiting 90 minutes for Omniserv staff to help her off her plane at Heathrow after a nine hour flight from Canada. When they did they tried to lift her under her armpits, leaving her carer to intervene and help, she said. She was so delayed that the door to the baggage reclaim area had been locked. "I wanted to cry," said Mrs Crispin. "I was so tired and so worn down by it all that I really did start thinking, is it worth it? Is two weeks' holiday worth all this aggravation?" Meanwhile, Heather McQueen, from Perth in Scotland, has vowed never to fly alone again following her experience with Omniserv at Edinburgh airport. She said she was abandoned by Omniserv staff for so long that she missed her flight and had to wait alone for hours for the next available one. "I was tired, I was in pain," said Mrs McQueen, who has multiple sclerosis. "I had to increase my pain meds the following day because any form of sitting for any length of time causes pain." Dr Natasha Hirst, from Disability Wales, said some of the complaints she had heard were "shocking", "humiliating" and "outrageous". "They are actually leaving people stressed, anxious, upset and feeling perhaps they don't want to go on holiday again," she added. "It's not acceptable." Former Paralympian Tanni Grey-Thompson, a member of the House of Lords, said she was "shocked" after X-Ray showed her the footage of Mrs Davies being lifted by Omniserv staff at Heathrow. "If somebody needs help being transferred, the absolute basic thing you should do is ask how a person wants to be lifted," Baroness Grey-Thompson said. "So to actually grab somebody under the arms, especially a woman, and grab them in the chest area is just absolutely horrible. "It makes me feel cold even just thinking about it." Omniserv, which also provides special assistance services at London Stansted and Liverpool John Lennon airports, has apologised. 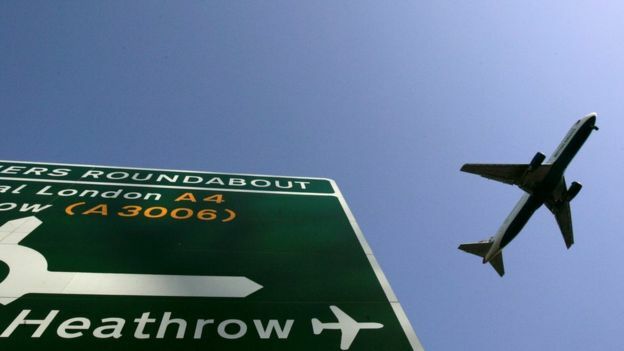 Heathrow Airport said it was "deeply concerned" about the complaints. Both Heathrow and Edinburgh airports added they were working hard to improve the journeys of their passengers.